One of our favourite “little” things to do when we are down in Orlando is to go mini-putting. We had a great time at Hawaiian Rumble Adventure Golf this year. Last Friday, it had been less than a week since we had been home, and we felt like doing something fun, so we headed to Niagara Falls to go mini-putting at Wizards’ Golf. This is the glow-in-the-dark mini-putt on Clifton Hill. I don’t know who did it, but the artwork is truly amazing! Well, technically I got back a week ago, but it was harder getting caught up on work and family and church responsibilities then I thought. As we often do in the late winter or early spring, we headed down to Florida. We rented a house for two weeks and went to Universal Studios, Islands of Adventure, Busch Gardens, Seaworld, and Aquatica numerous times. At some point in the next couple of weeks I’ll post some more thoughts (I’ve done this in the past) on what Niagara Falls can and can’t do to meet the Orlando standards. They’re huuuuuge. They’re big league. And one of them is coming to Niagara Falls. 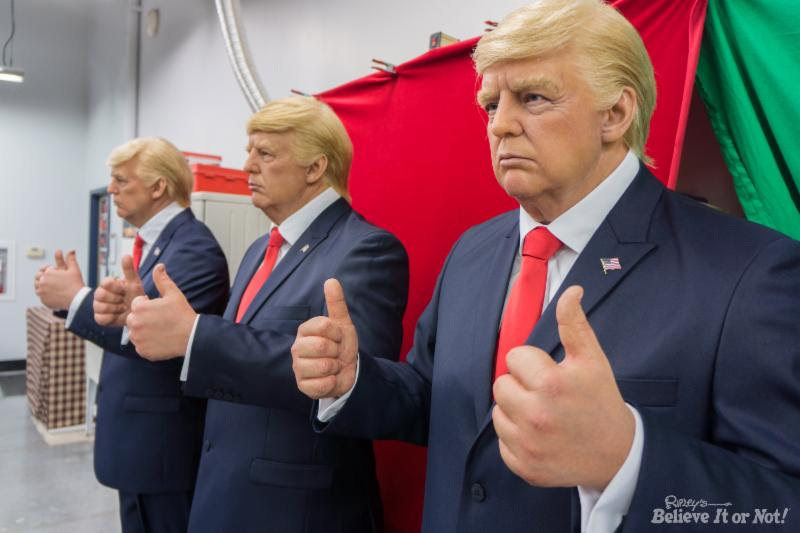 They’re the first wax figures of U.S. president-elect Donald Trump, and they’ve been hand-crafted by the F/X team at Ripley’s Believe It or Not! One was put on display last week at Ripley’s Orlando, Fla., Odditorium for a limited time, and is expected to be shipped to Louis Tussaud’s Waxworks in Niagara Falls in the new year, said Ripley Entertainment’s social-media specialist Suzanne Smagala-Potts. “We were going to have it for a very limited time in Orlando, but it’s been so popular there that they might keep it for a little bit longer,” she said. Orlando, Fla. (November 11, 2016) – They’re huuuuuge, they’re big league and they’ve been hand- crafted by the F/X team at Ripley’s Believe It or Not! They are the very first wax figures of Donald Trump. One is now on display at Ripley’s Orlando Odditorium on I-Drive. It is in the lobby and can be seen and photographed for free – but only for a limited time. 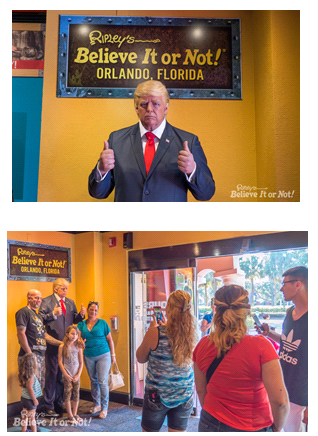 Just as in real life, the wax Trump is polling at about 50% – loved by some Ripley’s visitors, loathed by others. Ripley’s created three wax figures of the President-elect. They will go on display at Louis Tussaud’s Palace of Wax in Grand Prairie, Texas, and Louis Tussaud’s Waxworks in San Antonio, Texas and Niagara Falls, Ontario. Ripley Entertainment owns and operates the three Louis Tussaud’s Waxworks. Ripley’s F/X team started creating the first Trump figure about four months ago. Each is sculpted by hand by a team of artists, using photographs to create the likeness. Each figure takes about six weeks to complete. Win or lose, the Trump figures were destined for Louis Tussaud’s; after Tuesday’s election results they’ll now stand with other presidential wax figures. For images of Ripley’s wax Trump figures, visit this Dropbox. Ripley’s Believe It or Not! is part of the Ripley Entertainment Inc. (www.ripleys.com) family of worldwide attractions, the global leader in location-based entertainment. More than 13 million people visit its 95-plus attractions in 10 countries each year. In addition to its 32 Believe It or Not!Odditoriums, the Orlando, Florida-based company has publishing, licensing and broadcast divisions that oversee projects including the syndicated Believe It or Not! television show, best-selling books and the popular syndicated cartoon strip, Ripley’s Believe It or Not!, that still runs daily in 42 countries. Ripley Entertainment is a Jim Pattison Company, the third-largest privately held company in Canada. The other day I tweeted that the outside of Ripley’s was being painted. As I was looking for some logos for the Ripley’s visit postings, I came across the website for a graphic designer in Orlando who has done a few mock-ups of what it would look like. I don’t know which one they are going to use (if any), but they look good. None of them look like the colour that it is being painted. Here is an animated gif of the concepts. Please click through to the Melody Matheny website to see static larger images. I apologize once again for my lack of posting. It has been a very busy winter for me. I’m starting to see the light at the end of this, so I hope to be back to regular blogging soon. Thanks so much to Dan for posting some in my absence. Allegiant (Nasdaq:ALGT – News) today announces new, nonstop jet service between Niagara Falls, N.Y., and Orlando, Fla., via Orlando Sanford International Airport (SFB), will begin Feb. 15, 2012. The company, known for its exceptional travel deals, will introduce the new service with fares as low as $79.99* one way. Ikaika the killer whale was escorted out of the country in a procession worthy of a head of state. A witness said he counted at least 14 Niagara Regional Police cruisers, with lights flashing, two transport trucks and a crane slowly escorting the 9-year-old male orca from Marineland toward Hamilton airport on the QEW on Saturday evening. John (Ringo) Beam, manager of Rempel Maximum Ice Services in Niagara Falls, said he joked to some of the orca’s escorts that the procession from the amusement park around 9 p.m. seemed a tad excessive. The departure of Ikaika, also called “Ike,” comes at the end of a nasty custody dispute between the Marineland amusement park in Niagara Falls and SeaWorld in Orlando, Fla. The killer whale, the one at the heart of a custody battle between Marineland and SeaWorld, was removed from the Niagara Falls amusement park Saturday night by a fleet of transport trucks, a crane and more than a dozen Niagara Regional Police escorts cars. NRP Staff Sgt. Pat McCauley confirmed the Niagara police were hired on special duty to assist with the transfer of the whale.